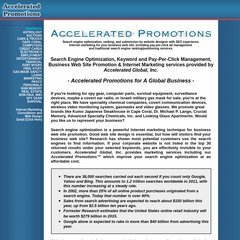 Topics: Website Promotion, Internet Marketing, and Results. Age: The domain is 17 years and 3 months old. The programming language environment is ASP.NET. Accelerated Data Works Inc (Florida, Gainesville) is the location of the Microsoft-IIS/6 server. It has 3 DNS records, khufu.acceleration.net, khafre.acceleration.net, and menkaure.acceleration.net. PING www. (216.155.99.6) 56(84) bytes of data. A ping speed test response, is timed at 45.5 ms.